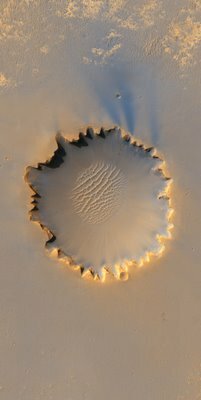 This spectacular, serenely beautiful photograph, compliments of the HiRISE high resolution camera on board the Mars Reconnaissance Orbiter spacecraft, shows Victoria Crater, an impact crater at Meridiani Planum, near the equator of Mars. The crater is approximately half a mile (800m) across. Even more amazing is that the Mars Exploration Rover, "Opportunity," has been exploring Victoria Crater, and can actually be seen (along with some of its tracks) in the photograph (remember, it's taken from orbit). Check out Bad Astronomy for more, including links to the closeup pictures showing the rover. This is unrelated, but, apropos of astronomy, I learned recently that our Sun and solar system are hurtling through space at some 43,000 mph, and that the direction it's heading is known by the pleasingly poetic term "the Apex of the Sun's Way." This phenomena was first described by astronomer William Herschel, whose son John, coincidentally, was the scientist who discovered that "hyposulfite of soda"—fixer—removed unexposed silver halides from emulsions, the last crucial puzzle piece in the process of making photographs permanent. Posted by: MIKE JOHNSTON with thanks to Will S.
I find this kind of aerial pictures beautiful, nature's art. Besides Google earth, you can download full res satelite imagery of the whole world from the NASA site, those are incredible. I love this stuff! MRO is going to show us things we've never seen before. The "archive" link at the bottom gets to all the old pics. and drag the "zoom" slider all the way to the "+". Another interesting fact about Sir William Herschel was also the person who discovered the infrared spectrum. Until he performed his now classic experiment with a prism and thermometers people believed the heat from the sun was enclosed in the visible spectrum. He also discovered the planet Uranus, the first planet discovered with the aid of a telescope. Wonder how many of those hi-res cameras are orbiting planet Earth ... and who is looking at their images. WAIT! That's an awful photo! I see fringing and sharpening artefacts! Whaddaya mean, "it's beautiful"?? 0.2% of the pixels are erroneous. That cannot be beautiful. Gives new meaning to the term "Street Photography" ! The Earth is also famous with similar caverns. Here is the picture of man-made Mirny open diamond mine in Yakutiya, Russia (the best I could find). It is approximately 800m in diameter too.. Here is the Google Earth link to the spot.